Is there an absolute truth in a flexible opening such as the Pirc Defense? After I had played and studied the Pirc intensively for more than ten years I was sure I had found the best move order against each White system. Then I stopped playing the opening for a while and when I checked new ideas I realized that things were not that simple. Thus, the repertoire I recommend on this DVD is a combination of good lines in my old repertoire that have stood the test of time and new lines inspired by my fresh look at the Pirc. 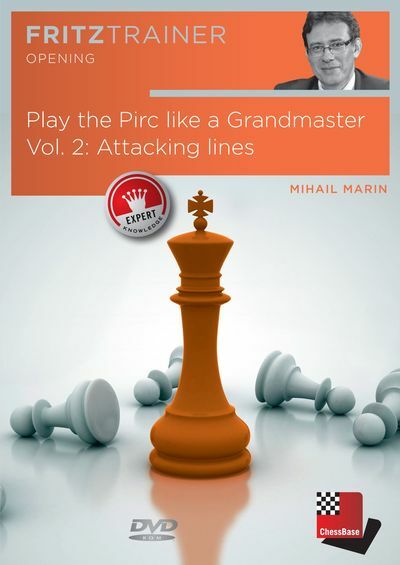 When playing the Pirc one must know what to do against White�s attacking systems. White�s space advantage offers him a lot of active possibilities, but when White proceeds aggressively he creates weaknesses in his own camp that Black can use for counterplay. There are a number of forced lines but they are mostly based on the elementary principles of dynamics and development. With these principles one should find one�s way when confronted with a novelty or... forgot the analysis! The resulting positions are usually dynamic or double-edged and offer fairly balanced chances. The better tactician may win, but do not be dissappointed if the game ends in a spectacular and logical draw! � Video running time: 4 hours 21 minutes (English) � Interactive training including video feedback � Exclusive database with 50 essential games � 2 �Pirc� articles published in ChessBase Magazine � Including CB 12 � Reader System Requirements: Minimum: Pentium III 1 GHz, 1 GB RAM, Windows Vista, XP (Service Pack 3), DirectX9 graphic card with 256 MB RAM, DVD-ROM drive, Windows Media Player 9, ChessBase 12/Fritz 13 or included Reader and internet connection for program activation. Recommended: PC Intel Core i7, 2.8 GHz, 4 GB RAM, Windows 7 or Windows 8, DirectX10 graphic card (or compatible) with 512 MB RAM or better, 100% DirectX10 compatible sound card, Windows Media Player 11, DVD-ROM drive and internet connection for program activation.